It is that time of year again when you may be focusing on eating healthier. One way to accomplish this goal is avoiding, as much as possible, ‘empty calories,’ i.e., foods that are high in calories and low in nutrients your body needs to stay healthy. Naturally, sugar is at the top of the list since it contains no protein, essential fats, vitamins or minerals. In addition to being loaded with calories that go straight to your waistline without giving you any type of nutritional benefit, sugar creates a vicious cycle that can promote weight gain. Sugar increases your cells’ resistance to insulin – a hormone secreted by your pancreas which helps your body keep sugar levels at their optimum. This resistance may make you crave more carbohydrates and sugar. You then eat more to satisfy the craving, and the cycle starts all over again. Sugar has also been shown to be highly addictive. Trying to cut back or eliminate it from your diet can create withdrawal symptoms similar to those experienced by people trying to stop using opioids, caffeine or nicotine. Like other addictive substances, sugar triggers what psychologists call a ‘reward response.’ Simply put, when we eat sugar, we feel good and experience a mild ‘high.’ Once this feeling subsides, we want more sugar to get the feeling back. And the more we eat, the more weight we gain. 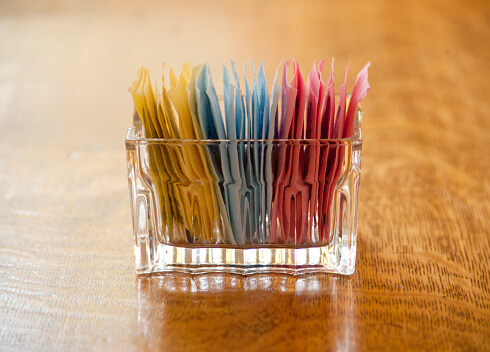 Are Artificial Sweeteners the Answer? You probably remember being a teenager when Tab hit the market, asking consumers, “How Can 1 Calorie Taste So Good?” It, and other sugar-free sodas of the time, seemed to be the dieter’s dream-come-true. Shortly thereafter though, in 1969, the U.S. government banned Tab’s original sweetener, cyclamate. Then followed warnings that its new sweetener, saccharin, had been found to cause cancer in laboratory animals. The government later lifted this warning, but questions about the safety of artificial sweeteners have continued to this day. More recently, artificial sweeteners have been linked to everything from developing Alzheimer’s disease to cancer. One recent study suggested that drinking a can a day of an artificially-sweetened beverage was associated with an almost three-fold increase in developing stroke or dementia compared to people who drank less than one can a week. The researchers admitted, however, that they could not prove a direct causal link. Despite this caveat, the study was enough to create doubt and concern. If potential health risks weren’t enough reason to reconsider using artificial sweeteners, new research also suggests that using them could actually promote weight gain. The reality is that having a diet soda may save 150 calories while the average cheeseburger-and-fries combination packs over 1,100 calories. The diet soda doesn’t even make a dent. Another current theory why artificial sweeteners may be counterproductive to maintaining or losing weight is that our brains read a sweet as a sweet, regardless of its source. Under this hypothesis, our bodies react to the sweetness in artificial sweeteners in much the same way they do to sugar. The same or similar reward response is triggered, and so we want more sweetener to get the same ‘high’ and the cycle starts all over again. One organic-based sweetener that I have researched, tried and liked is stevia. It is a natural sugar and sweetener substitute that is extracted from the leaves of the plant species Stevia rebaudiana – which is a member of the chrysanthemum family. It is believed to have originated in Paraguay. It has zero calories, no carbohydrates and a glycemic index of zero. There are generally three main types of stevia you can purchase: green leaf stevia (the least processed option), stevia extracts and altered stevia. You can use stevia to replace sugar in baking. With stevia, a little goes a long way. It is reportedly 100-300 times sweeter than table sugar. A 2010 study by the NIH found evidence that stevia lowered glucose and insulin levels in both lean and obese people. Another earlier study suggests stevia may help lower cholesterol. Several studies report stevia is rich in anti-inflammatory compounds and antioxidants that may help prevent cancer. It may even have antimicrobial properties and help fight bad bugs and infection. To make sure you are getting the benefits of stevia, you have to be mindful of which stevia products you consider purchasing. Stevia may also interact with medications you may be taking, particularly medications you may be taking for diabetes, blood pressure and cancer. Talk to your doctor if you have any health issues and are interested in adding stevia to your diet.